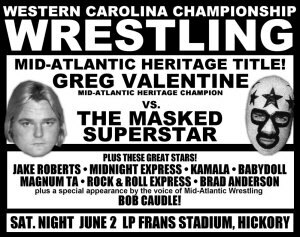 Mid-Atlantic Heritage Champion Masked Superstar pins Brad Armstrong in Georgia. Pay no attention to the foot on the ropes. The Mid-Atlantic Heritage Championship celebrates the wrestlers, promoters, and fans of the old Mid-Atlantic wrestling territory of the NWA, and is only contested by wrestlers who were active in the 1960s-1980s and who at one time or another worked for Jim Crockett Promotions. 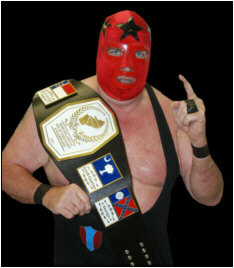 The reigning Heritage champion is the Masked Superstar (Bill Eadie) who defeated Greg Valentine for the championship belt in June of 2007 in Hickory NC. The title was established in February of 2005 in Spartanburg SC by the Mid-Atlantic Gateway. A promotional graphic based on the old newspaper wrestling ads of the 1970s.